Published: Sept. 1, 2014 at 05:54 p.m. 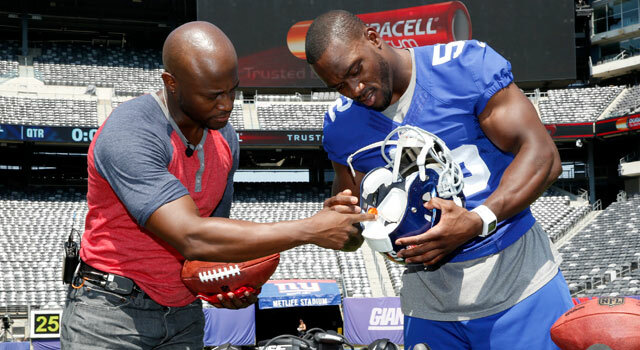 Updated: Sept. 1, 2014 at 08:24 p.m.
New York Giants' Jon Beason, right, demonstrates the communication devices that are powered by Duracell Quantum batteries to actor Taye Diggs at MetLife stadium on Wed., Aug. 27, 2014 in E.Rutherford, N.J. More than 650 of these batteries power every NFL game. The heart of the New York Giants' defense is back on the field. Middle linebacker Jon Beason practiced Monday for the first time since mid-June, when he tore a ligament in his foot and fractured a bone in his toe. "He brings a presence that we've been missing," defensive tackle Cullen Jenkins said Monday, via the New York Daily News. "He's a leader, a natural leader, an intense person, and it's great to have him back." Beason is confident that he will be ready to play in Detroit on Monday night, but a final decision won't be made until later in the week. 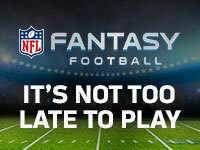 The Giants' defense hemorrhaged an average of 35 points per game until Beason arrived in an October trade last season. That average improved to 18.3 the rest of the way. Beason recently told the Around The NFL Podcast that the Giants' defense improved upon his arrival because the players started to "buy in" and get on the same page. With Beason returning to full health and pass rusher Jason Pierre-Paul finally recapturing 2011 form, Perry Fewell's defense should be the stoutest in the NFL East.